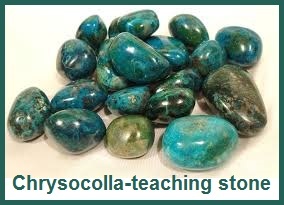 Chrysocolla is a teaching stone, that helps you communicate the right words when needed. It is a stone of peace, increased wisdom, and discretion. It promotes level headedness, encouraging clarity of thought and a neutral, cool attitude during turbulence. It can be used to decrease nervousness and irritability. It is empowering of the feminine energies and is associated with the solar plexus, heart, and brow chakras. It calms, cleanses, and re-energizes these Chakras. The mix of greens and blues acts on the heart and throat chakras, reaching up to the deeper blue of the brow chakra and the related minor chakra at the base of the skull ( the medulla oblongata). This energy point clears blockages in the emotions and belief systems. EXERCISE: Place a piece of Chrysocolla at the heart, throat, base of skull, or in the center of the forehead to create a rearrangement of energies that results in a clearer view of emotional issues. Start by focusing on a problem or situation you wish to understand better. Then relax and let the stone help bring resolutions to your conscious mind. (This exercise is explained in Healing with Crystals and Chakra Energies by Sue & Simon Lilly).